100 years of ridicule followed that conversation. Every woman in the city must have knocked on Mrs. Noah's door and looked on her with pity. "Poor Mrs. Noah, her husband has gone crazy and still she stands by him and even says she believes he's heard from God on this." Women know women. And, we know that a woman can either be your best friend or your worst enemy. She can be the one who lifts you up or who drags you down. Think about your friends, your enemies, and yourself. How do you respond to a person who truly believes that God has spoken a holy and precious promise to..when that promise seems highly unlikely to you? Now, I don't even like to begin thinking about what the actual trip must have been like. I imagine it as a time of great sorrow and mourning. To have literally lost every friend you've ever known, and to know that they've all drowned, flailing outside a door that God himself closed, is more than I can fathom. And to consider the stench inside that ark, and the constant motion and hopelessness would have been horrendous. 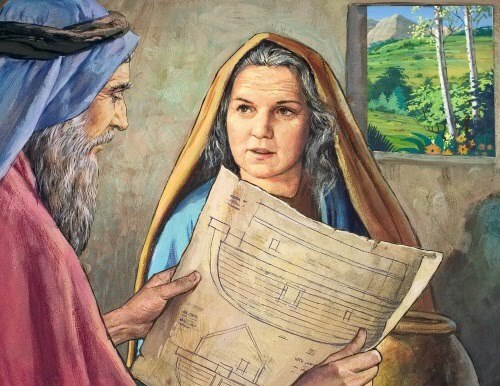 However, after coming to a place of peace and stillness outside that boat and inside her heart, Mrs. Noah stood on a lush, green mountaintop, and experienced another of God's promises, under the beauty of the first rainbow mankind had ever known. Her world would never be rocked in this way again. She was loyal, she was faithful, she worked hard, and she should be honored for presenting Christian women with one more look at a story that would have looked so different, if she hadn't played her part...and played it well. She was a real woman.